The Movements of Human Potential. Rome, 9 November 2018, 14p.m. – 18p.m. The Study Center on Freedom of Religion and Belief (LIREC), as part of its Awareness Project successfully concluded the conference “The movements of human potential. Pathways and paths for personal development in secularized society”. The Study Center on Freedom of Religion and Belief (LIREC), as part of its Awareness Project organizes the conference The movements of human potential. Pathways and paths for personal development in secularized society. The intent is above all to provide a correct information on organizations whose history and philosophy go back rather far back in time (in particular, to the Enlightenment). The focus will be on movements that, while not identifying with a specific form of religiosity, refer, however, to specific values that are on the border between the spiritual and philosophica dimension. The conference intends to provide the historical, philosophical, ethical, psychological and sociological references necessary for the understanding of this galaxy of groups, whose diffusion sometimes arouses controversies and debates. The movements of human potential, in fact, are placed within a context characterized by otherness: a typical trait is the development of "alternative" techniques to deal with the problems related to the health of the mind and body, which wants to join or oppose traditional medicine. On this path we often create new habits of community life, ranging from diet to learning: models often arbitrarily stigmatized as fraudulent or harmful that, looking beyond diversity, are rather a useful starting point for reflection on the freedom of consciousness. 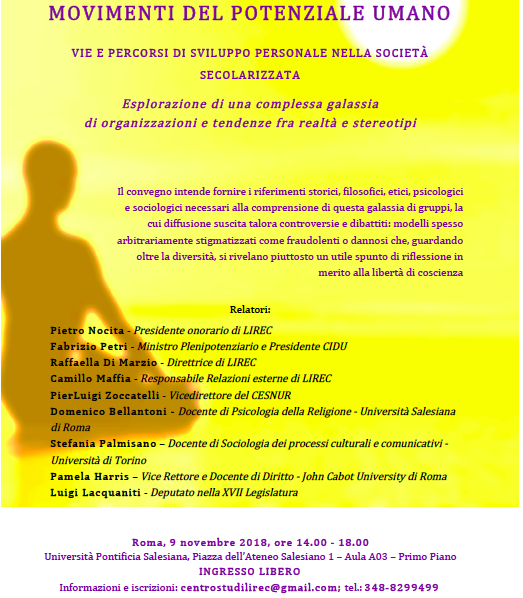 The conference, which is held under the patronage of the European Academy of Religion, will take place on Friday, November 9, 2-6 pm, at the Pontificia Università Salesiana (Piazza dell'Ateneo Salesiano, 1 - Aula 3, Primo piano).